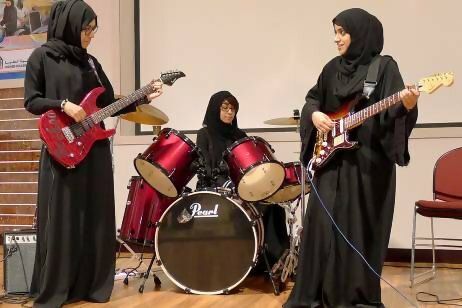 A few months ago we had Pragaash, Kashmir’s first all girl band, now Random Stars have become UAE’s first all girl rock band. The five piece group all went to the same technology college and were brought together by English teacher Jackie Smalls. They started off playing hard rock covers but are now looking to work on their own songs in the next school year. The group is made up of Bushra Hassan Al Hashimi, 22, rhythm guitar, Hamda Al Ghaithi, 22, lead guitar, Aysha Salem Al Kaabi, 20, bass, Aysha Abdullah Al Maskari, 21, drummer and Almayasa Al Kaabi, 22, keyboard. Bushra Hassan Al Hashimi told The National: “Playing rock ‘n’ roll is awesome. We are the first girls from the UAE who play electric guitars as a band. Looking forward to their first EP. Tags: girl band, random stars, uae. Bookmark the permalink.